When a solution for dust control is needed, Den Bakker Dustcrusting technology b.v. (dbd global), is an expert in dust control and prevention. The company now has a demonstration team available. This makes it possible to show the many advantages of Dustcruster® technology at a customer’s own site. With a special self-supporting demo kit, consisting of: a tractor with a smaller 8,000-litre tank trailer, potential customers can experience the many advantages of Dustcruster®. That way, they will know what Dustcruster® can do for them, in their own working environment with the actual circumstances. Another advantage of the demo team is that the solution of dust problems can be demonstrated to the local environmental services. The correct water canon fitted to the demo trailer will be able to lay a tough and long lasting crust on every possible coal/iron ore stock pile. Also part of this demo kit is a smaller version of dbd global’s mixing container which it uses to mix Dustcruster dry®. The water needed for mixing is to be supplied by the customer to create the sprayable Dustcruster liquid®. dbd global’s products are inexpensive and an environmentally friendly (natural) product. dbd global has developed a range of solutions to help with dust control, including a range of specially designed water spraying vehicles, each having particular capacities and performances to suit the needs of a specific site or condition. The constant desire to improve led to the development of a very effective method to control dust on most of the sites where it is needed: the Dustcruster® technology. DUSTCRUSTER LIQUID® Dustcruster liquid® is an inexpensive and environmentally friendly (natural) product. After spraying onto coal and iron ore stacks, it forms a real ‘crust’. This crust safeguards the stockpiled product from being lifted by the wind and transporting dust, and lasts for a very long period. Rain hardly affects its effectiveness. Only after digging into stockpiles is it necessary to repair the crust by spraying on a new layer at the disrupted area. Dustcruster liquid® has also proven to be a very effective means to settle large sand areas around infrastructural projects and has successfully been used to prevent the escape of dangerous fumes during soil cleaning operations. Dustcruster liquid® has been proven to be a better solution than many other products because of its longer setting time. In order to reduce transport charges and to allow the use of the technology on a world scale, Den Bakker Dustcrusting b.v. has created Dustcruster dry®. Dustcruster dry® is a mixture of different fibres which are crushed into pellets and are transported in FIBC’s or containers. On location, the Dustcruster dry® pellets are dropped in a special mixing tank with clean water where they transform into a liquid suspension, Dustcruster liquid®, ready for use. Here also, the special spraying trucks are required to successfully cover the coal/iron ore stock piles creating a tough and long-lasting crust. Water plays an important role in controlling dust. Humidity helps dust to settle making it more controllable. Den Bakker Dustcrusting technology b.v. has also developed several systems for stationary spraying equipment. dust along coal and iron ore conveyer belts. These jets create a very fine water spray resulting in maximum dust settling with minimal water. An added bonus is that the road alongside the conveyer is sprayed at the same time. Dust control when handling/crushing wood and stone is particularly problematic, as using water can cause humidity problems. Den Bakker Dustcrusting has created a system where only a small amount of water is needed to create a large amount of foam.This larger foam surface is an excellent dust collector, and results in a better dust-free working environment. The foam is created using special equipment that requires only 98 litres of water for a maximum of 2 litres of foaming agent to make a staggering 5,000 litres of foam.The foam is quite tough and long lasting. Depending on the actual activities performed the foam can last anything from 3 to 12 days. Apart from the benefit of less humidity problems there is a huge saving on water. Den Bakker Dustcrusting technology has gained vast experience in the control of outdoor dust and uses very advanced systems, stationary as well as mobile, with natural fibre and/or with polymers or other products, which can operate under the most severe conditions, including frost and strong wind. The dbd global demo team is ready to go to any site in the world in order to analyse specific conditions and offer a valuable solution. The cement, mineral and coal processing Industries are currently experiencing immense pressures to greatly reduce and eliminate their pollutants, especially their uncontrolled fugitive dust emissions. Environmental groups and public opinion are consistently championing the need to increase control over industry. Maintaining clean air and water are the driving forces that currently mobilize plant personnel to maintain vigilance. 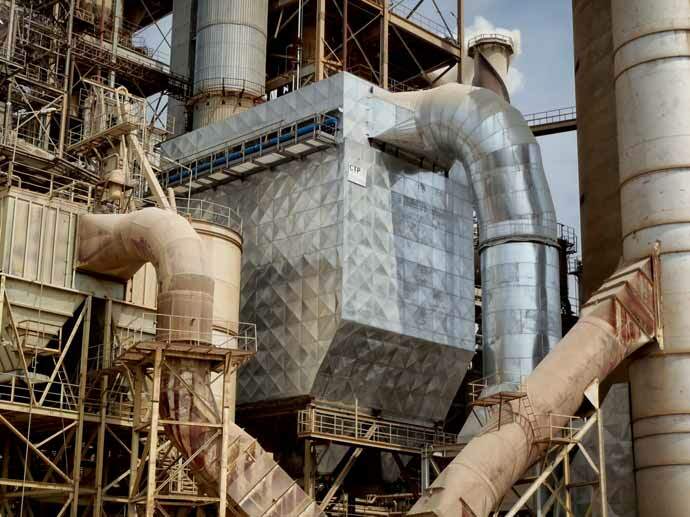 During the past several decades, the two main weapons employed in restricting dust from escaping the plant’s domain have been containment and collection. Containment has involved shrouding the product from air currents and spillage, keeping the fugitive dust encapsulated within purposely-designed chutes and steel tunnels. Collection draws errant dust into steel suction ducts, depositing the material into bins in preparation for returning it to the process flow. Both systems have made significant technical advances and they still play an important part in the ongoing fight against dust pollution. Applied Conveyor Technology Inc.,The ACT Group, has been manufacturing dust suppression high and low pressure, fog or spray systems for over 20 years. An efficient dust suppression system is usually designed to both prevent dust from leaving the main product body and act quickly to return dust to the product if it becomes airborne. There is no single solution for every fugitive dust problem; each situation brings with it its own particular set of conditions that need to be evaluated prior to resolving the matter. The vast majority of suppression problems are resolved by utilizing plain water as the medium, however in exceptional cases, the addition of chemicals to the water flow may be required. Water is by far the most common medium used in suppression systems. It has the ability of ‘wetting’ extremely fine particles of dust while they are still in the body of the product increasing particle weight reducing its ability to become airborne. This effect also applies to dust that has become air borne; particles encountering wetness increase in weight and drop back onto their source. The addition of water to individual dust particles also creates a ‘cohesive force’, causing each particle to adhere to adjacent particles, resulting in an increase in weight promoting them to fall back to the dust source. Low pressure spray is a form of suppression consisting of a pump capable of providing a water pressure of between 50 to 150PSI, typically driven by an electric motor (general rule of thumb — the lower the pressure, the larger the volume of water used). The water is filtered through a 100-mesh strainer in order to eliminate solids prior to being delivered to the spray heads to prevent clogging and premature wear. The unit is normally housed within a steel frame, which provides mechanical protection while on site and is easily transportable without the need of a forklift. The system can be utilized as a temporary form of suppression or it can be a permanent fixture. Due to the operating size of the pump and motor, the unit has limitations with regard to deliverable water capacity, attaining a maximum flow rate of approximately 6 GPM. It is not unusual to see several of these units together, and each focused on a particular area of the locality, thus jointly providing an overall suppression system. Systems are often customized to suit the application and location. Raw water is usually drawn from a main supply or storage tank by a booster pump; this will aid the water’s passage through a series of specially designed filters, removing harmful solids prior to reaching the pressure pump and spray nozzles. A pump driven by a selected motor provides between 500 to 800 PSI of water pressure, which is then directed via suitably selected nozzles forming flat sprays over the product. The sprays are normally arranged to overlap in order to provide complete curtain coverage. Although this form of suppression system can be designed to provide a temporary solution to mobile plant, it is usually more applicable to base the system as a permanent dust suppression source. High pressure fog sprays are basically systems that provide water droplets that have been generated using water under extreme pressures along with highly engineered nozzles, and need to be effective while utilizing minimum volumes of water. The atomized droplets are normally less than 10 micron in diameter. In areas such as conveyor transfer points where dust will become air borne, it is necessary to utilize a system that will grab the fugitive dust and drag it back down onto the product. Such a system requires high-pressure sprays that form a water mist.The high-pressure system delivers filtered water between 800 to 1,200PSI, creating a mist type curtain preventing the dust escaping. A simple change of nozzles allows the high pressure spray system to convert its effect from mist to actual water spray; however the water usage is increased slightly. Fog should only be used in confined or contained areas since it is small and light. Spray, on the other hand can with stand air movement and is effective in such areas as truck dumps, open hoppers, open head chutes crushers, train dumps and ship unloading. Nozzles are spaced on the spray lines according to the intensity of the dust generation and natural air velocities. Water sprays with foams are created by maintaining the dosing method and utilizing a suitable surfactant, then adding pressurized air, ‘foam’ is produced, which can provide a blanketing effect, thus holding the product to the conveyor. The foam has an excellent residual effect, enabling the number of spray points to be reduced. An established foam system can expand the surface area of a given volume of water 60 to 80 times, thus allowing far much lower rate of moisture addition to the product. Additional applications of the high-pressure fog system are in odour control and its ability to provide humidity in arid locations. Today, many industrial companies try to combat dust using water or other dated methods. Wuvio Chemicals is active in combating dust using three biodegradable chemicals. Besides combatting dust, these products will generate savings on water, minimize losing the product itself and helps companies across the world in maintaining the vitality of their work environment. Freko Crust is a solution using biodegradable chemicals which forms a thin, hardened layer or crust on dust emitting goods in storage (for instance coal, iron ore, limestone, waste, phosphor or woodchips). The crust can last up to three months and it is unaffected by harsh weather conditions (strong wind, heavy rain, hail and snow). Based on the client’s need, crust duration can be adjusted to achieve cost saving. One litre of Freko Crust requires 10–20 litres of water to be distributed over the commodities. Freko Crust has proven to work longer and better than, for example paper pulp. Freko Crust will be active for three months regardless of any type of weather. Where paper pulp loses its effect after rain, Freko Crust will be reactivated. Freko Crust has undergone profound developments before getting to its current shape. The Crust has developed according to the demand of clients who wanted a clearly visible crust. This visible aspect appears to be very important to the (immediate) area. In there last few years, there has been a noticeable shift of emphasis from actually combating dust to showing the surroundings and local residents that action is being taken regarding dust nuisance. The best way is to combine the visible aspect with the actual function of combating dust. That is why Freko Crust is given a colour. At the moment multiple colours are available, depending on the demands of the client. Freko Foam is a solution using biodegradable chemicals which forms a foam layer on dust emitting goods in transit (for instance, coal on conveyor belts in a harbour). The Foam sticks to the dust particles occurring in transport and makes them stick together. Stuck together, the particles are too heavy to float. As such, the Foam prevents dust emissions for up to three days. Freko Humidifier is a solution using biodegradable chemicals which are dispersed by canons or sprinkler installations in industrial processes where dust particles are emitted. Examples are waste installations and discharging sites, building sites and drilling sites. In normal situations dust particles do not absorb water due to differences in surface tension. Freko Humidifier breaks the surface tension of water, causing the dust to absorb the water, making it too heavy and more effective than untreated pure water. Wuvio Chemicals was founded in 2003 in the Netherlands and engages in dust and odour control and sanitization in industrial environments. The company develops dust solutions by utilizing biodegradable chemicals and proprietary technologies in innovative ways. Wuvio Chemicals started out by solving immediate dust problems in the waste processing industry. Currently it is mainly serving sectors such as storage and transshipment of coal, recycling, power generation, mining and hospitals. Since 2008,Wuvio Chemicals has strategically started to shift its attention to Asia’s booming industrial markets and the massive environmental problems it causes. In September 2012,Wuvio Asia was launched in Hong Kong and Beijing to serve the Asian market. In China, air pollution and smog are huge problems. China recognizes these problems and they now get the attention they need so much. Wuvio Chemicals participates in solving these problems by supplying its products and giving advice to industrial companies. This summer Wuvio Chemicals started a division in France in order to serve and operate better in the south of Europe. Besides the activities in Europe and Asia,Wuvio Chemicals will start operating in South Africa by the end of this year. A key Florida power supplier has adopted a series of innovative dust containment measures on its coal handling system, helping the facility reduce potential hazards from fugitive material accumulations and significantly cut down the number of man- hours spent on clean-up. By limiting dust and spillage from one of its primary conveyors, the energy provider has reduced airborne particles and virtually eliminated a potential source of trips and falls, while allowing critical manpower to be deployed on core business activities. Preventing coal dust spillage also helps minimize wear on rollers and other moving components, saving on replacement part costs and labour. Orlando Utilities Commission — Stanton Energy Center (SEC) is one of Central Florida’s leading environmental stewards, meeting or exceeding all air permit limits with advanced pollution control equipment, while generating electricity to serve more than 342,000 residents. The company also follows a well- structured housekeeping policy with respect to its working environment, cleaning the entire coal yard and all handling equipment every day. To address the situation, Martin Engineering supplied and installed a number of upgraded components, including Double Apron SealTM Skirting, which employs two wear surfaces on a single elastomer sealing strip installed along the bottom of the skirtboard in the loading zone. When the bottom side of the sealing strip is worn, it can be inverted to deliver a second service life. The skirtboard sealing system is installed on the sides of the loading zone to contain dust, eliminate spillage and reduce cleanup expenses. Believed to be the first dual-sealing system of its type, it incorporates a primary seal clamped to the steel skirtboard to keep lumps on the belt and a secondary or “outrigger” strip to capture any fines or dust particles that might pass beneath the primary seal. Next, Martin Engineering technicians installed an impact cradle to better absorb the force of the falling material and protect the belt and structure. The cradle stabilizes the belt’s line of travel to help prevent the escape of fugitive material. In addition, a belt support system was added to better support the edges and eliminate sagging. To maintain precise centreing in the loading zone, a belt tracking system was also installed for immediate, precise adjustment. Comprised of upper and lower components, the tracker works to reduce belt edge damage, prevent spillage and extend belt life. A key element in the material handling system upgrade was addressing the large, under-performing dust collector. “We wanted to upgrade our dust collection equipment, because we knew technology had advanced since ours was installed,” said Maintenance Supervisor Jon Janis. “Even when it was functioning properly, the old unit was a high-maintenance item,” he added. The Martin Engineering team installed a high-efficiency insertable air cleaner with an explosion-proof motor. The automatic, self- cleaning design employs filter elements approximately one-eighth the size of conventional filter envelopes, allowing a significant reduction in the dust collector’s space requirements, so it can be installed in tight quarters. to reduce the overall power consumption of the collection system. The new design features a pulse cleaning system, which uses a short burst of air sent back through the filter to dislodge accumulated material. Filter changes are a no-tool procedure from the clean side of the dust collector. He added that continued service excellence has helped to make OUC a repeat customer. OUC is a municipal utility owned by the citizens of Orlando, providing electricity and water services to customers in Orlando, St. Cloud and parts of Orange and Osceola counties. Founded in 1944, Martin Engineering works tirelessly at making bulk materials handling cleaner, safer and more productive. The company supplies flow aids and conveyor products around the world for a wide variety of bulk material applications, including coal, cement/clinker, rock/aggregate, biomass, grain, pharmaceuticals, food and other materials. The firm is headquartered in Neponset, IL, offering manufacturing, sales and service from factory-owned Business units in Brazil, China, France, Germany, Indonesia, Mexico, South Africa,Turkey, India and the UK, and under exclusive licence with ESS Australia. PEBCO® recently introduced the patent-pending, Self-Contained Dustless Loading System, or SCDLS. The SCDLS incorporates a dust collector integral with the loading spout. The system provides an innovative and extremely low profile design; and offers highly effective dust control for environmentally responsible loading of dry, dusty materials into trucks, railcars, ships, barges, and stockpiles. An essential advantage of the SCDLS design is the fugitive dust captured is re-entrained into the product being loaded, minimizing product loss. Additionally, handling of the captured dust by ancillary equipment is not required. This design provides a complete and integrated dust control solution for loading trucks, railcars, ships, and material stockpiles. The clean air fan includes a damper system for tuning the airflow through the SCDLS. The ability to easily tune the airflow allows application with a wide variety of products. The adjustable damper system permits the operator to capture fugitive dust without capturing the product being loaded. Controls are available to operate both the loading spout and the dust collection functions of the SCDLS. Controls can be custom engineered for each user’s specific loading requirements. The PEBCO® SCDLS was developed in collaboration with Donaldson/Torit utilizing their proprietary Power Core filter media and pulse system. Power Core filter cartridges are available in both conventional and static dissipating materials of construction. Cartridges are easily replaceable through large access panels located on the side of the SCDLS (with no special tools required) and all wear components are bolt in for ease of replacement. Seeking solutions for its customers’ unique material handling problems has led to the development of several patented products, features, and options for equipment used in the dry bulk solids handling industry. It has proven PEBCO®’s experience, versatility, and innovation. To enhance our drive for complete customer satisfaction, PEBCO®’s quality management system has been certified to ISO 9001:2008. PEBCO® is recognized worldwide as a preferred manufacturer of powder and dry bulk solids handling equipment. PEBCO®, the ‘Material Handling Problem Solvers’. Dust is not only disturbing, but even dangerous to health. For this reason, there are legal rules in most countries for a reduction of dust emissions. BUT HOW CAN DUST BE REDUCED EFFECTIVELY? It is known that water is principally suitable for reducing dust emissions, as can be seen in typically dusty places after any rain shower. Unlike rain or sprinkling units that wet material completely and silt it up to eliminate the dust, a well-designed water spraying system achieves optimal dust suppression with possible low water consumption. This is the essential advantage of such systems; dust is only bound and the material is not silted up. However, the degree of effectiveness of dust suppression with water depends on many parameters. Beside the affinity of the material to generate dust, plant conditions such as conveying speed, fall height of the material, as well as ambient conditions have a considerable influence on the effectiveness of a dust suppression system. When designing a water spraying system for dust suppression, this means by far more than only placing some nozzles elsewhere. The expertise of the supplier of such solutions is the crucial factor for the effectiveness of the dust suppression system. Since 1975,VSR Industrietechnik GmbH, Germany has been supplying reliable and cost-saving solutions for the handling of bulk materials. The product group DUSTEX® as a solution for dust suppression completed the product programme since the middle of the eighties. Since that time, DUSTEX® dispersion and water spraying systems for dust suppression have been successful in practical applications all over the world. Beside the actual systems for dust suppression,VSR INDUSTRIETECHNIK GMBH also offers engineering work for encapsulation and air guide plates. These may considerably increase the effectiveness of spraying systems as they guide the dust-laden air directly to the spaying unit so that the dust can be prevented from becoming airborne. From simple belt transfers up to complete bulk handling facilities, beginning with ship unloading and further via belt transfers up to stockpile irrigation. VSR supplies, on request, turnkey solutions from engineering up to taking into operation. As the requirements of each customer are as individual as the bulk goods he is working with, it is very important that each solution is adapted to the specific problems of the customer. In order to match the problem and to offer an optimal solution for dust suppression to each customer,VSR uses several systems enabling it to offer solutions specified for the requirements, even in combination of the several systems. The DUSTEX® water spraying system works with water only. With a working pressure of up to 16 bar the water is finely atomized. The droplet spectrum is between 50–150μm as per nozzle type and working pressure. Among others, it is applied when it is not possible to encapsulate the site, when slightly higher water consumption does not interfere or the material humidity should be increased. The DUSTEX® dispersion system works with water and compressed air. The centrepieces are the air atomizing nozzles with resonance head, developed by VSR, which are designed to atomize water with compressed air. The droplet spectrum of these nozzles is between 10–50μm depending on the pressure. VSR offers three nozzle types that cover a water flow rate per nozzle of 10 litres/h up to 185 litres/h. Thus it is easily possible to atomize more or less water only by a simple nozzle exchange, even after installation. The DUSTEX® dispersion system is always applied when it is not desired to increase the humidity of the material, only airborne dust should be bound, water has to be used economically, or very low emission values have to be observed. The DUSTEX® fog blower is the newest product of the DUSTEX® group. It works the same as the DUSTEX® water spraying system, only with water with a maximum pressure of 16 bar. It guarantees maximum flexibility to the user thanks to its variable applicability. The fog blower is always applied in areas where permanently changing conditions require a flexible solution. Here dust can be bound in larger areas or material can be kept humid on changing stockpiles. All three DUSTEX® systems have one crucial point in common. With all units, it is possible to comply with the legal regulations for dust emissions valid in Germany. In different projects where measurements have been made, the dust emissions could be reduced by more than 90%. A short project story may illustrate the possibilities of the DUSTEX® Systems: In a bifid longitudinal limestone storage in Romania, both conveying routes should be dedusted. The points to be dedusted are the transfer from the inlet belt conveyor to the movable, reversible belt and the discharge of the movable reversible belt to the storage. The chosen solution was the DUSTEX® dispersion system. The control of the DUSTEX® system was realized by SPS that transmitted all relevant operating information of the spraying system such as pressures and flow rates to the main control room. A main valve cabinet included all essential fittings for control and regulation of the spraying points. Two further valve cabinets were installed onto the reversing belts in order to execute the changeover of the discharge side of the belt. The supply of the media water, compressed air, electric to the movable reversing belt was carried out by means of hose and cable drums. After the unit has been taken into operation and an optimal adjustment, it shows that the dust suppression results completely fulfilled all expectations of the customer. Wind blows the dust, so control the wind and you control the dust. It is as simple as that. A typical wind fence dust control system is 80% efficient, and it works 24 hours a day. That is a lot of control. WeatherSolve Structures works to solve customers’ dust issues. So how does this fence work? A. Wind accelerates up the side of a pile eroding dust off the surface. Smaller particles rise in the air, larger ones bounce down the other side and along the ground. With a wind fence in front of the pile, wind speed is reduced so only smaller particles erode. Some of these rise in the air; others bounce down along the ground. B. With both downwind and upwind wind fences, particles moving along the ground stop at the fence. Many airborne particles are filtered out by the fence. Others go through and some go over. Most going over drop in the sheltered area behind the fence. WeatherSolve has created a specialized clip for the overload release system. Poles and foundations represent the most significant portion of the structural cost; the WeatherSolve release system provides security in extreme storms. Extensively tested in the 200mph winds of Hurricane Andrew and many hurricanes since then,WeatherSolve Structures allow fabric to be released from the bottom of panels and later re-clipped into place. Fabric always stays connected at the top of each panel so it never becomes a safety hazard. Reliable: functional in extreme weather conditions with minimal maintenance. Over 35 years of experience and engineering development has gone into the design and components. They stand up and WeatherSolve stands behind the capabilities of the structure. The structures have proven successful in a wide range of extreme environments — from marine, to northern cold to Middle Eastern deserts. Flexible: able to accommodate a wide range of equipment access requirements. All of WeatherSolve’s fences are custom designed to suit the individual needs of the customer. The company is able to accommodate conveyors or any other equipment, doorways and gates for people or vehicles. It also has retractable systems for areas requiring regular access. Convenient: can be constructed with minimal operational disruption. This is achieved because the systems have few poles or other obstructions. Portable: for sites such as gravel crushing or sifting of small stockpiles with portable conveyors, the company has a range of portable (towable) wind fences typically 20–30ft high. Adaptable: can be adapted to suit available construction materials and equipment. The fences are custom designed to match the customer’s requirements, both structurally and aerodynamically. Economics: installing a wind fence is good for the environment, but it’s good for the bottom line too. For example, ore dust assays many times higher than ROM material so it makes economic sense to keep it on the pile. WeatherSolve wind fence designs are optimized by considering turbulent wind flows and dust particle tracking results obtained from detailed large-scale virtual models. The models are solved using computational fluid dynamics run on high performance computers that can take as long as 24 hours to run a single set of computations! The modelling work is performed by Midwest Research Institute Global, a not-for- profit, independent research organization internationally recognized as an expert in the field of fugitive dust emissions. Environmental management and pollution control pose major concern to all sectors of mining, steel, power, cement, agro- commodities and other core industries. Each time products are elevated, transferred or handled, they generate dust in high-volume. Dust control is a significant means of preventing explosions in bulk storage units, mainly grains and reduces environmental contamination. With the increase in awareness of the problems related to pollution, a challenge has arisen to solve and control the spread of air pollution. Strict environmental regulations as well as the sensitivity with respect to air pollution has motivated TMSA (Tecnologia em Movimentação SA), from Brazil, to adopt new approaches in engineering with an emphasis also on waste reduction for controlling the airborne dust emitted due to transport, transfer, storage and distribution of bulk materials. To reduce dust emissions to the environment, to minimize explosions and fire risks,TMSA installs de-dusting systems at the emission source where the dust is aspirated, collected and treated or is controlled with very low or negligible emissions, maintaining the dust in the product flow. It contributes to reduce maintenance costs, preserve cleaner environments which improve health care, operational efficiency, and good neighbour relations. Conveyor design also plays an important role in dust control. Conveyor designs with low belt speed / control of air flows / eliminating bumps between idlers / covered conveyors / optimal chute designs / minimizing transfer points. Use of enclosed conveyors: screws, redlers, specially designed belt conveyors as Manutubes (belt conveyor inside a plastic tube) and Pipe-Conveyors. Tight bucket elevators with good boot and head designs with no back legging and moderate belt speeds. Avoiding long chutes with high angles and installing speed reducers. Avoiding dust accumulations and dust turbulences inside conveyors. Energy efficiency, work safety and reliability are no longer a wish list for dust control systems. Dust can be explosive and its explosiveness depends on multiple factors. In order to assure that an explosion is not produced, the Risk Triangle with its equation ‘dust + oxygen + ignition’ must be altered. The elimination of any one of these requirements will prevent the reaction.This can be done by neutralizing ignition sources or eliminating or reducing the emissions of dust. Dust is eliminated by controlling its generation or installing vacuum systems that collect the dust in filter bags at each point of emission. Dusts are particles with a diameter size between 1 to 100 microns, each particle type and composition influences its explosive risk. A concentration greater than 30gr/m3 of air shows explosion risk, with dust of less than 60 microns. Most grain dust is a mixture of fine and larger particles. The size of dust particles in suspension appears to be less than 63 microns in diameter. Larger particles will not normally remain in suspension without some kind of external assistance. The explosiveness of dust generally tends to increase as the particle size becomes smaller. Dust of 40 microns particles and less is the most dangerous and should preferably not be returned to the grain stream, but taken from the collectors and stored in a bin remote from the grain storage facility. TMSA offers different tools to control the dust: conventional with aspiration/innovative with no aspiration. For any type of dust suppression system the principle is to suppress the dust at the source and thereby preventing it from becoming air borne. Dust suppression systems are tailor made depending upon the application and behaviour of the dust generation and requires equipment sizing and selection considerations for capturing, conveying and collecting, plus hood and ductwork design options, system balancing and testing, fans or pulse-jet or compressors and exhaust stacks. TMSA’s dust collection systems are engineered to each application offering a complete range of bag houses and styles ranging from round and square configurations. The compact filters collect dust in each source and returns the dust to the product flow, are an alternative to centralized aspiration systems.The big advantage is their reduced size, low energy and that the collected dust is discharged directly on the dust generation point, continuing the product flow and making unnecessary the installation of dust containers and long collection tubes. TMSA offers solutions related to hopper assemblies for receiving from a wagon or truck granular and/or grains dumped into a pit for storage or removal from the base of the pit while controlling and containing the dust during dumping. TMSA’s ‘Aspiration Systems’ have gravity baffles that pivot with the weight of the falling material. When unloading in the intake pit, the system only opens in the spot where the product falls into the pit while the remaining pit area stays closed. At the same time, the generated dust quantity is collected through dust collectors and sucked down through the pit by means of a fan upon which the dust is separated through a filter. provides the unique method of controlling the emission dust from a pit into which granular or grains are being dumped, with no aspiration. Control of the dust is provided by the use of controlled metering sections of louvers and dumping sections which constitute a part of the cover for the pit. The DustMaster offers a cleaner work environment; direct payback comes in the form of lower cost installation, energy savings and savings from the reduced shrinkage. Dust control for loading trucks, wagons, silos, ships and barges TMSA uses conventional solutions for loading trucks, wagons or vessels as retractable or telescopic loading spouts, and has also developed and patented a special dust control system for loading vessels: the ‘Dust Trap’ and recently has incorporated the DSH- Dust Suppression Hopper from New Zealand. which requires no air, no moving parts nor energy, has been incorporated with great success, having interesting and successful applications in Argentina and Brazil. This dust-free loading spout ingeniously contains the dust within the product stream when discharging dry bulk materials. Thus, it cleverly avoids the need for the more complicated retractable or telescopic loading spouts. Traditional applications are for loading trucks and railcars, but in Argentina the DSH is solving a chronical problem in big flat storage facilities at huge soya processing plants. While loading 50,000 to100,000 tonnes soya or soya meal silos, the dust generated during the loading is so abundant that the front loaders that work inside during unloading, are incapable of operating. The installation of DSH hoppers has solved this problem, making the environment inside the silos a workable area. In Brazil it has been implemented in ship loaders in the port of Santos, having achieved 1,500tph (tonnes per hour) with great satisfaction and now,TMSA has received orders for DSH’s loading vessels at 2,000tph and 3,000tph. TMSA Tecnologia em Movimentação S/A, is one of the big suppliers in the South American market for bulk solids material handling, especially in port terminals and heavy duty and long distance conveyors, together with its dust control systems. The head office is in Porto Alegre, Brazil, where the company has an important manufacturing shop of 35,000m2 with large and highly integrated engineering capabilities, with in-house mechanical, civil, structural, electrical, automation and de-dusting specialists; all under ISO 9001:2000 certification. Dust is a widely recognized industrial hazard, writes Peter Guttridge, Guttridge Ltd and Ian Walton, DSH Systems Ltd. Capable of forming an explosive cloud, it also presents an inhalation danger for operational personnel, and can create visibility problems. Controlling dust is crucial for health, safety and environmental reasons and may also be driven by economics. Dust spreading through an operating area is lost product and has an associated value. One of the routine operations capable of creating problematic clouds of dust is bulk material intake or outloading, from a lorry into a storage building, for example, or vice versa as product is released from a factory for distribution. During this operation even granular products such as grain, fertilizer, sand and salt can release significant quantities of dust, inhibiting the efficient and safe progress of the task. Such dust release can be especially problematic in certain areas — close to urban centres, for example – where there is particular sensitivity to air pollution. In this paper, Peter Guttridge, Chairman of Guttridge Ltd, and Ian Walton, CEO, DSH Systems Ltd, examine the issue of dust release during bulk material loading, why it happens and the problems it creates. The limitations of conventional equipment are considered within this context alongside the potential benefits of adopting alternative, more modern dust suppression technology. Example data illustrate the cost savings associated with dust suppression and the factors that should be taken into account when evaluating an associated investment. Transferring and transporting granular products is a daily task for many processors but the associated release of dust, typically defined as particles in the 1–100 micron size range, can be problematic. Figure 1 provides a clear illustration of why. From an environmental perspective the release of dust is, most immediately, an issue of air contamination. This is an important and growing problem as the potential hazards of respirable dust are recognized, and population centres develop around facilities that may, in the past, have been some distance from a community of any size. However, fugitive dust emissions are also a potential source of watercourse degradation and their monitoring is becoming increasingly stringent for this reason too. Tackling environmental issues is becoming critical for facilities anxious to secure good community relationships and an on-going licence to operate in the face of tightening legislation. The fine nature of particles present in a dust can, under certain circumstances, promote very rapid reaction/combustion, which is why dust clouds formed from flammable materials have explosive potential. The lowest concentration of dust in air that is capable of supporting an explosion1 (the ‘lower explosive limit’) varies from material to material but typically lies in the range 10 to 500g/m3. While this figure may seem quite low, it represents a relatively dense fog of particles and so, in practice, is relatively rarely exceeded during routine loading operations. More broadly however, even non-toxic dusts may be associated with a decline in lung function3 making it essential for bulk material handlers to install appropriate control and exposure prevention strategies. Machinery that has to operate in a dusty environment may be prone to low reliability caused by, for example, inhibited lubrication and enhanced wear. The frequent change out of filters designed to protect equipment is also a time-consuming task in dusty environments. One way to prevent such problems, and to simultaneously improve the operating environment, is to adopt an effective clean-up policy, but this too is manually intensive, adding to the overall cost of operation. Especially for a valuable product, the amount of material lost through fugitive dust emissions can be surprisingly high, and may justify expenditure in superior bulk handling equipment. Most bulk materials are relatively low cost but even with these products the annualized overall cost of losses can be significant. When it comes to tackling a potential dust control problem there are three possible strategies: prevention, isolation and/or control. Conventional technology is typically based on the second and third approaches while more modern, dust suppression systems tackle the problem at source. Retractable or telescopic bellows are the traditional choice when it comes to loading operations. The mode of operation of this technology is relatively simple and illustrated in figure 2. Telescopic bellows provide an enclosed route from the source of the material to its destination via a series of conical shaped ducting elements that slot into one another. These allow the length of the overall ducting to be varied to fit the application, and during loading. Bellows, around the central duct, minimize material loss. With telescopic bellows, emptying cannot take place with the assembly fully up. The outlet is lowered as close as possible to the receiving vessel, to control material flow, but there remains a gap that is sufficient to allow dust release. Telescopic bellows are well established and relatively inexpensive, despite having a complex mechanical design to allow for the lifting up and down involved with their use. However, cables, pulleys and associated electrics are required for operational control and these, in addition to the number of moving mechanical parts, impose a substantial maintenance burden. From a practical perspective, telescopic bellows are a flexible choice for different loading operations, but troublesome for lorries with cross members, since these bars can inhibit optimal positioning. Furthermore, as product emerges from telescopic bellows in an aerated state, air-induced segregation, the separation of dissimilarly sized particles, is also a potential problem. This can compromise the homogeneity, and value, of a product, and cause flow problems during discharge. For many the biggest drawback of telescopic bellows, though, is the issue of dust release. In some installations this is tackled with integral dust extraction systems, others employ air extraction to minimize dust generation, or filter out fines ahead of transport. Stringent clean-up procedures are an important control measure in many facilities. But all these complexities add to the overall cost of operation and highlight the multiple advantages of applying a solution based on prevention, rather than isolation and control. The Dust Suppression Hopper (DSH) prevents the formation of dust clouds during the transfer of granular solids. Figure 3 shows a DSH operating in the exact same environment as the telescopic bellows shown in figure 1, demonstrating its performance. This list is far from exhaustive and recent additions include compressed wood pellets and other pelleted products for the biomass industry. In general suitable materials are dry, granular and free-flowing, as fine, sticky powders do not perform so well. material phase. A conical outer hopper is suspended from the top frame of the unit by a number of springs, and a safety chain. Within the hopper is a central plug which remains stationary at all times. As material flows into the DSH its weight causes extension of the springs and the outer hopper lowers relative to the stationary central plug. This opens up an annulus, allowing the material to discharge. However, flow is maintained only if there is a sufficient head of material to provide the downward force necessary to extend the springs. If not then the annulus will close. In practice the outer cone gently oscillates up and down during discharge, as the balance of forces between the non-linear springs and weight of material fluctuates. This action maintains the characteristic solid-looking stream of product. Unlike a telescopic bellows a DSH is installed directly beneath a feed point, suspended at some height above a target, such as a lorry filling bay. Aside from the constrained up and down movement of the hopper this height is maintained throughout discharge. Most of the complexities associated with the telescopic bellows design are therefore eliminated.The DSH has no internal moving parts and requires no utilities for operation. The way in which the DSH operates leads to material discharge in the form of a densified, almost solid stream containing very little air. As material flows into the hopper, from the feed silo, natural agitation and settling lead to limited air release. Then, because the material is pushed out of the annulus against the opposing pressure of the springs it undergoes a further ‘squeezing’ action. The result is a ‘condensed’ stream of material that is extremely tolerant of fall height. During transfer any dust present is entrained, and drawn down into the material column, and there is minimal dust emission when the product hits the ground.The squeezing out of air also largely eliminates segregation. The simplicity of the DSH translates into low maintenance costs and the almost complete prevention of dust release for a many industrially significant bulk materials. However, the DSH, like many newer technologies, carries a higher upfront capital cost.This raises the question of how to financially assess different options for bulk materials loading and how to put a value against the potential benefits afforded by alternative systems. Right at the beginning of this paper we discussed the reasons why dust control is important. Returning to this list of reasons helps to formulate a strategy for assessing the value of dust suppression technology and to highlight areas where value might accrue. Where dust suppression measures make the difference between a site maintaining its licence to operate, or not, then their value is clearly very high. The need to meet regulatory controls is similarly non-negotiable. In other instances though the arguments are more nuanced, creating a requirement to quantify the value of mitigation measures against their costs. The following simple calculations illustrate how savings can be calculated for some of the potential benefits. A daily discharge operation results in two hours of clean-up for one operator. Assuming an hourly rate of £10.00 per hour and weekday operation this equates to £5,200 per year. If the dust suppression technology can reduce the amount of cleaning effort required by 85% then this equates to an annual saving of £4,420. An operator handling product in 26-tonne loads estimates that each load contains 50kg of fugitive fines. 10 trucks are loaded each day, for five days a week, for 48 weeks of the year. In the course of the year the total amount of fugitive fines potentially lost is therefore 120 tonnes. A potash manufacturer transports product by truck, rail and container. The scale of the operation is 35,000 tpa of product which has a sale price of around £300 per tonne. Estimates suggest that across the operation product losses may be reduced from 0.1% to 0.05 with the installation of dust suppression technology. For many bulk material handlers dust control is a critical issue, especially during loading operations. Being a ‘good neighbour’ is increasingly important for companies with strong ethical policies and on a more pragmatic basis can play a crucial role in operational longevity. Stringent health, safety and environmental laws are a powerful driver for improvement in many countries. The Dust Suppression Hopper (DSH) prevents the formation of dust during loading operations tackling this potential problem at its source. Experience suggests that this technology not only solves critical HSE issues but also pays its way with economic benefits accruing in the form of reduction in clean-up, maintenance and product loss. its primary customers are foundries and mills that re-use the valuable materials as feedstock for new products. The firm has also made a significant investment in the processes and technology to recycle paper and plastics — and more recently, electronics — continuously building relationships with scrap dealers, logistics providers and buyers across the country. Now in its fourth generation of family management, the firm strives to leverage a century of scrap management expertise, implementing industry best practices for optimal efficiency, while maintaining the highest level of environmental stewardship. As part of that philosophy, PADNOS is constantly developing and refining its approach to fugitive material management, with a goal of preventing the escape of any dust or spillage that may be generated by its activities. In late 2012, the company researched equipment to deliver open-area dust suppression at its downtown location in Holland, MI. company officials wanted to take proactive measures to ensure that dust would not create a nuisance for the surrounding community or create a workplace hazard. The DB-60 is supplied by Dust Control Technology (Peoria, IL). The atomized misting unit generates millions of droplets specifically sized to maximize dust suppression, and then launches them over large distances in an engineered air plume created by a powerful ducted fan. A 25 HP electric motor gives the machine a reach of nearly 200 feet (about 60 meters), allowing the oscillating unit to cover an area as large as 125,000ft2 (more than 11,600m2) with a virtual dust blanket. Supplied with a 20ft (6m) mounting tower, the DB-60 was installed atop a 10ft (3m) concrete pedestal to increase its range and aiming ability even further. The control panel, booster pump and three-way valve are located inside a shed for protection. From the time of its initial arrival, the PADNOS team was pleased with the results of using the DustBoss. “The performance of this design is better than any method we’d tried in the past, and eliminating the manual spraying presented immediate labour savings for us,” Driesenga said. Though it’s one of the largest models DCT offers, the DB-60 uses less than 24 gallons (90.85 litres) of water per minute, even with the booster pump raising pressure to 160 PSI (11 bar). The unit was originally supplied with four optional remote controls, giving loader operators the ability to turn the unit and the oscillation on or off at any time. The oscillation range, however, was only programmable at the panel. Although the system performed well, operators noticed an opportunity to even better serve the unique layout and work flow at the Holland plant, so they contacted DCT to discuss some possible modifications to the system. “We felt that we could make dust control even easier and more efficient for the operators who are moving our material,” said Driesenga. “The easier the equipment is to operate, and the more efficiency we can build into the dust management process, the more likely that the equipment will be used, and used correctly,” he added. During the initial meeting, Driesenga explained that loading and unloading could take place at nearly any point within the roughly three-acre area, and the 359° oscillation was a key to reaching those activities. But the relatively slow oscillation speed prevented a quick rotation of the barrel to focus on an arriving truck. Operators had to wait for the machine to oscillate to the required spot. The big question was whether DCT could redesign the unit to reach any point on the oscillation arc in 30 seconds or less, AND build the control capability into the remotes that the company already had. Adding the ability to set the arc remotely would also be a huge bonus, relieving operators from having to visit the control panel. Engineers from DCT decided that they could achieve the desired repositioning speed by replacing the fixed-speed oscillation motor with one that turned approximately 4× faster, coupled to a variable-frequency drive (VFD). To avoid having to ship the unit back to IL for the revisions, DCT personnel performed the gear motor change-out, panel modifications and VFD installation on-site. While maintaining all existing controls on the remotes, DCT technicians also added the ability to select from eight pre-set oscillation ranges, which could be programmed by operators from the modified panel with its touch-screen display. Finally, they added a ‘Jog Left/Right’ switch and a ‘Home’ button to the remotes for quick repositioning. PADNOS handles recyclables for industrial and commercial accounts in the US. From California to the far Northeast of Canada, the firm actively manages scrap for clients with accuracy, efficiency and control. The company prides itself on developing efficient, environmentally-responsible processes for all phases of its business, with a culture that fosters collaboration, creative problem-solving and continuous improvement. Dust Control Technology is a global leader in dust and odour control solutions for scrap handling, recycling, demolition, mining and rock/aggregate processing. The company’s DustBoss® product line delivers both airborne and ground-level dust suppression, helping to reduce labour costs vs. manual sprays and free up manpower for core business activities. The automated units also use less water than hoses and sprinklers, with some customers realizing payback in less than six months and netting an annual cost savings of more than $50,000. ISG Pit to Ship Solutions has designed a dust free logistic system to transport products from the mine site into the ship’s hull using sealed containers and a tippler. The product is not handled again until it is tipped into the ship’s hull, says Garry Pinder, Managing Director of ISG Pit To Ship solutions. The system involves the use of sealed containers and current port infrastructure in either bulk or container ports. Moreover, the system can be set up and running in six months, compared to the five years with other current systems. When looking at the benefits of this system, we can see that there is no product loss, no pollution out of the container or into the sampled product, there is no need for expensive and labour-intensive storage sheds or conveyor belt systems. Containers are loaded at the mine site and then taken to the port either by road or rail. Then, at the port, whether it’s bulk or containerized, the containers are block stacked awaiting the ship’s arrival. Once the ship has arrived, the containers are taken around to the key side, using a tippler attached to either a land- based crane, ships crane or overhead crane. The containers are lifted into the ship’s hull where once inside the hull the ISG patented lid lifter lifts the lid off the container, the container is then turned 360 ° and the product unloaded. The lid is then returned to the container inside the ship’s hull and the container goes back to the stack ready to be transported back to the mine site to continue the process all over again. The containers never leave the country and are used in a round loop process from pit to ship. tippler. Mining companies have no more environmental dust issues, their product is not lost during the transport and loading process, and they can move the containers to their next project when finished. In Australia, copper concentrate class 9 dangerous goods are being loaded next to pristine white beaches and yacht clubs, without dust residual located outside the ship’s hull. Mineral sands and iron ore are also loaded at the same port using containers and tipplers, and all are given the tick of approval by the Environmental Protection Authority (EPA). The beauty of this system with copper and mineral sands is that you can sample at the mine site knowing that no pollution can get into your product. You can also block stack your product, so when you are blending in the ship, you have different classes of your product already sampled to blend in the ship. For example, you can advise port operators to use 200 of one stack, 50 of another stack and another 100 of a third stack to provide the required blend you need. product type has a different Specific Gravity (SG) and this determines the container height. The tippler is designed to use gravity to assist in the turning cycle and product height is critical to this operation. The pride of the fleet is the copper and mineral sands containers as these commodities are at the high end of the mineral value price. We have designed our containers to be sift-proof and the lid is an automatic design that is locked when the lid is placed on them at the mine site and is only opened inside the ship’s hull with the tippler, this is an automated system with no manual labour required. Our iron ore container can also have the lid option to stop dust and the container being filled with water in high rain fall areas. Furthermore, our nickel and coal container design allows for high cubic loads. Once government officials and environmental advocates understand this system and see the green potential, there will be a domino effect. Port authorities with low export rates will also perceive a new opportunity to gather business that was previously out of their reach. conveyor belt system costs around US$100 million, tipplers costs around US$450,000 each, and normally three tipplers are purchased by the port and the containers are purchased by the mining companies. So, when making the comparison, you would need US$150 million including a dust problem or else around US$13 million and no dust problem. If you currently have a container port, you only need the containers and tipplers, all the other infrastructure is in place. An overloaded bulk terminal can store the container several miles away and road them in when the ship arrives, using the ship cranes to load them into the ship’s hull. Currently, there are different good practice examples of this system in Chile, Argentina, Africa and Australia. At present, the benchmark is in Australia but the other locations are catching up. NEW FRONTIER IN GAS FILTRATION TECHNOLOGY With a history stretching back over 44 years, CTP Team Srl (part of the Bedeschi Group) is an engineering and manufacturing company, highly specialized and well-referenced in gas filtration technology, writes Roberto Binago, Sales & Projects Director CTP Team Srl - Bedeschi Group. Mainly devoted to cement industry applications, CTP can apply its expertise in different and complementary markets, such as metals, minerals, chemical in general, waste-to-energy and glass. The continuous improvement in air filtration techniques and consequent enhanced bag cleaning efficiency, have enabled CTP to develop technologies that allow for progressively longer bags. This process, which has been ongoing for 30 years, still continues today. All CTP bag filters for process applications are equipped with the specific SWAP technology (Sonic Wave Acceleration Pulse) for bag cleaning, offering superior efficiency and increased bag lifetimes while reducing energy consumption thanks to a new generation of high-performance components. CTP has successfully commissioned plants worldwide — either converting existing electrostatic precipitators into bag filters or installing completely new equipment — and these plants are evidence of the excellent results that CTP’s technology achieves. The technology is both extremely powerful and very simple. The new projects that CTP has been awarded, mainly in the cement industry, confirm the company’s prominent position as a reliable partner for gas filtration and cleaning plants. Process filtration has shown dynamic developments in recent years, particularly in the cement industry. A quick overview of CTP’s improvements in researching a continuous enhanced efficiency in the regeneration of progressively increased bag lengths, shows how in the past 30 years a completely different design concept of baghouses has been possible (see Image 1, above). Bag length has been more than trebled in that time, particularly for process units in cement applications. In this image, each point represents a cumulative number of plants designed by CTP with the same bag length. This picture reflects a market trend which made it possible to reduce the equipment footprint with increased flexibility in the layout arrangement of new plants. In the case of upgrades of existing lines — and particularly during the design of old precipitators conversion into bag filters — the installation of longer bags increases the ability to re-use the existing structures and make it possible to maximize the capacity of the modified unit once in operation. the valve and the elimination of Venturi, normally located at the mouth of the bag, a short and very fast pulse acts as a wave and travels along the entire bag at sonic velocity regardless of its length. The innovation is related to a much shorter valve opening time and reduced inertia of the valve elements which lead to significant improvements in terms of cleaning efficiency, energy consumption and long-term reliability thanks to a lower compressed air pressure but enhanced pressure induced inside the bag up to the very bottom area. The final result is a shape of the pulse which is such that the required acceleration of the filter fabric is achieved over a much greater length of the filter bags than with any other cleaning system available today in the market. Besides, a highly reduced consumption of compressed air required from the compressor is able to clean an increased quantity of long bags at the same time, extending the expected lifetime even more. Depending on the size of the blow pipe, bag and pneumatic valve, this system is able to clean more than 30 bags at the same time with length up to 14m which is currently under testing in CTP laboratories. It is worth mentioning that CTP dedusting units, thanks to their superior cleaning efficiency, can operate with on-line cleaning procedures. This means there is no need to isolate the filter section during the cleaning cycle, and results in mechanical simplification, reduced installation and maintenance cost and maximum reliability of the system. The first installation featuring the SWAP system was commissioned in 2007 and up to now 21 plants have been commissioned with this technology, whilst a further 25 projects are under erection or during the engineering phase. It is also interesting to point out another aspect of this powerful technology: it deals with the combination of extreme cleaning efficiency and reduced energy consumption which has been reached. In other words, the continuous increase of bag length has been followed by CTP together with a huge increment of the number of bags cleaned by the same pulse-jet valve. Image 3 shows this development started more than 30 years ago. Thanks to SWAP technology, up to now, the result has been that a higher number of longer bags cleaned at the same time with a unique valve, led to an increase of the cleaning area by more than six times performing bag filter units to restore almost 120m2 of filtering area at a time with one single shot of compressed air at low pressure lasting just few milliseconds. The good performance of many bag filters successfully commissioned by CTP, confirm this positive trend and more and more users are updating their guidelines concerning the use of longer bags opening a new scenario for the design of baghouses for cement applications where dust loads of the gas to be filtered are extremely severe and plants must comply with the latest regulations in terms of emissions. Once 12m and 14m long bags shall be completed, even more compact filters’ size shall be in operation in the near future equipped with SWAP cleaning system. A list of new projects featuring SWAP technology, confirms the leadership of CTP Team as reliable partner for the major cement producers. Client: EREN HOLDING — Medcem plant in Silifke (Turkey). Project: No.2 new kiln/raw mill bag filters for new 10,000tpd kiln line — 8m bag length — capacity 2 × 785,000 Am3/h. Client: CATIC Beijing Co., LTD for SÖNMEZ ÇIMENTO A. . – Adana plant (Turkey). Project: kiln/raw mill bag filter — 8m bag length — capacity 900,000Am3/h and clinker cooler bag filter — 8m bag length — capacity 600,000Am3/h for new 5,000tpd kiln line. Client: ÇIMSA ÇIMENTO — Eskisehir plant (Turkey). Project: kiln/raw mill bag filter for kiln line 1–8m bag length — capacity 443,000Am3/h. Client: ÇIMSA ÇIMENTO — Mersin plant (Turkey). Project: kiln/raw mill bag filter for kiln line 3–8m bag length — capacity 379,500Am3/h. Client: OMAN CEMENT CO. — Muscat plant (Oman). Project: Alkali Bypass Bag Filter for 3,000tpd kiln line — 6.5m bag length — capacity 250,000m3/h. Client: SINOMA INTERNATIONAL ENGINEERING CO., LTD for Southern Province Cement Company — Tahamah Plant (KSA). Project: kiln/raw mill bag filter — 9m bag length — capacity 1,260,000Am3/h and clinker cooler bag filter — 9m bag length — (capacity 600,000Am3/h) for new 5,000tpd kiln line. Project: No.2 Kiln Alkali Bypass Bag Filters — 8m bag length — (capacity 2 × 664,000Am3/h), and No.2 clinker cooler bag filters — 8m bag length — (capacity 2 × 490,000 Am3/h) for 5,700tpd kiln line 3 & 4. Project: No.2 coal mill bag filters for 2 × 95tph VRM — 6m bag length — total capacity 800,000Am3/h. Project: cement mill bag filter for 300tph VRM — 10m bag length — capacity 725,000Am3/h. Client:A KALE Ç MENTO — Erzurum Plant (Turkey) — see Image 6 below.